I am very happy to announce that Borrowed Time is now available on the Amazon Kindle store. Revisit the adventures of Ness and Dr. Bertrand as they struggle to keep the world’s first time machine from those who want use it to twist the future to their own ends. You can make this exciting adventure part of you own collection HERE if you’re in the United States, and HERE if you’re in the UK. I have been thinking about getting an ebook reader for the last couple of years. I’ve looked over the Kindle, Nook, and Sony readers most of the times I’ve roamed though my favorite store, Best Buy. Part of my hesitancy was the cost of the unit, not to mention the cost of the ebooks themselves. But as the years passed the price has dropped on both to the point where they began to get attractive to me. This year I found myself with a Best Buy gift card for Christmas, along with some other BB money, so I thought the time was probably right to make the leap into an ebook reader. I had several reasons for doing so. First of all I am involved in the creation of digital content, and have had an ebook for sale for over a year, so it made sense for me to experience first-hand this method of consuming content. Second, it’s a gadget, and I loves me a new gadget! It has been a while since I’ve bought one, and I was feeling the itch. Finally, since I probably spend more time doing recreational reading than pretty much anything else, it made more sense to buy an ebook reader, then, say, a new gaming console. I did have a tiny qualm in that I hate doing any long-term reading on a computer screen. That’s why I always print out my novels to edit them. So I wasn’t sure if I was going to like reading off of a display as opposed to paper. This was one reasons I wanted to stay away from the back-lit, Nook Color kind of screen. So after the first of the year I began to look seriously at ebook readers. It quickly came down to the Kindle or the Nook. The other models either seemed too slow, or I didn’t like the button placement, or had a backlit screen. Now I do have this predisposition to not get the big kahuna of a gadget just because they’re the biggest. I tend to be sympathetic to the seller with less market share but who has a great product. This is what drove me to the Microsoft Zune instead of buying an iPod (this was also helped by the fact that I don’t like Apple’s business model, but that’s another post.) So right out of the gate the Nook had an advantage over the Kindle. But if you follow me on Twitter or Facebook you know that the Kindle won out. The Nook and the Kindle seemed to be pretty equivalent, but the speed of the Kindle seemed a bit better, as was the rated battery life. Those two factors swung it for me, along with the fact that Amazon, while an 800-pound gorilla, is not Apple and I really have no issues with the company. So I bought it at lunch last week, went to an nearby McDonald’s for a quarter-pounder and the free wi-fi, and five minutes later I was reading my first purchased ebook, Half Share by Nathan Lowell. I have since finished that book and another. I’ve downloaded several free ebooks and bought a couple more. I love the reading experience, and am officially hooked. Another reason I had for getting an ebook reader is that I’ve had to start using “reader” glasses. By slightly increasing the font size on the Kindle I am able to comfortably read without having to wear magnifying glasses at all. The screen has great contrast without being shockingly white, and the fonts are crisp, making it very easy to read. The battery life seems to be pretty good. I’ve only charged it the once and I’ve been leaving the wi-fi on. It has a basic browser which is OK. It is not a surfing machine, and I didn’t expect it to be. But I’ve used it to update my books on Goodreads, and to look up actors on IMDB for a movie we were watching last night. Since I’ve always got it near where I sit, it was convenient to just turn it on and get online. I’m sure I’ll be spending more per year on books than I have in the past, but I can still get some ebooks from my library. I also have access to pretty much all of the classic literary works for free, and I’ve already downloaded several such as Sense and Sensibility and A Tale of Two Cities. I plan to read several of these that I’ve skipped over the years. I’ve made it a point over the years to support the book launches of many of the podcast authors I follow, such as the aforementioned Mr. Lowell, and I will continue to do so via ebooks. So if you’ve been thinking about getting an ebook reader I would encourage you to make the plunge. I haven’t even tried out all of the bells and whistles on my Kindle and I love it. Oh, and if you already have one, make sure to get your own copy of Borrowed Time, just like I have! If you don’t have a Kindle and would rather read it on your PC or Mac, just download the free reader app, buy the book, and you’re good to go! What’s that? You have a Nook or some other ebook reader? Not to worry! 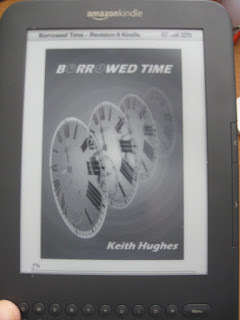 Borrowed Time is also available in pretty much every format known to man via the Smashwords site. You can also find it as a NOOKbook, and on the Sony, Kobo (with a 5-star rating! ), and Diesel ebook stores. Now if you will excuse me, I’ve got some reading to do!